Earn free travel rewards with CheapCash. By joining CheapCash, I accept all Terms and Conditions. Get even more value with CheapTickets Price Guarantee! If you're looking for a great (and cheap!) hotel in Sacramento, CheapTickets is the best place to find them. We offer deals on the best 197 hotels throughout Sacramento. No matter what you're looking for, we have options for you. Grab great rates on the 59 affordable 3-star hotels that are easy on the wallet without sacrificing comfort. Looking for more luxury? Try one of the 7, 4-star hotel accommodations in Sacramento. No matter your budget needs, we've pulled out all the stops to make sure you have plenty of vacation options. Maybe you prefer to search for your hotel deals based on what each hotel offers? For example, let's say you just want to find a hotel or resort that has a pool to cool off in after a long day exploring Sacramento. Scroll down to choose from the 147 hotels in Sacramento that has a pool for guests. Or search for deals on Sacramento hotels offering free wifi or breakfast, non-smoking rooms, and more! CheapTickets is here to be your personal travel agent for your next trip to Sacramento. Get booking today! What hotels in Sacramento offer free wifi access? Are there deals on Sacramento hotels offering free breakfast? Yes! The only thing better than finding a great deal on a cheap hotel in Sacramento is finding one that offers free breakfast. Grab some eggs, a waffle, or some healthy oatmeal before a day full of exploring Sacramento and all that it has to offer. Below are just some of the many hotels that offer free breakfast in Sacramento. Four Points by Sheraton Sacramento International Airport is a 3.00 star rated hotel property in Sacramento that offers free breakfast. 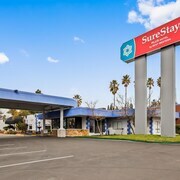 SureStay Plus Hotel by Best Western Rocklin is a 2.00 star rated hotel property in Sacramento that offers free breakfast. 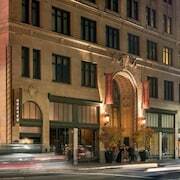 The Citizen Hotel- Autograph Collection is a 4.00 star rated hotel property in Sacramento that offers free breakfast. 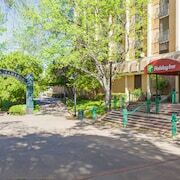 Vagabond Inn Executive Old Town is a 2.50 star rated hotel property in Sacramento that offers free breakfast. What about deals on pet-friendly hotels in Sacramento? Sacramento is a great place to get outside and explore with your pets in tow so don't leave your furry friends behind. Below you'll find great deals on hotels in Sacramento that allow pets. Don't forget to bring plenty of treats! Extended Stay America Sacramento - Elk Grove is a popular, pet-friendly, 2.50 star hotel in Sacramento. La Quinta Inn Sacramento Downtown is a popular, pet-friendly, 2.50 star hotel in Sacramento. 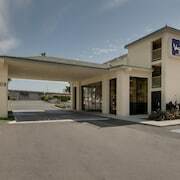 Motel 6 Sacramento West is a popular, pet-friendly, 2.00 star hotel in Sacramento. Best Western Plus Orchid Hotel & Suites is a popular, pet-friendly, 3.00 star hotel in Sacramento. Any good rates on Sacramento hotels with restaurants? Absolutely. Don't want to deal with planning our all your meals on your trip to Sacramento? We don't blame you. Keep the hangry away by staying in one of the 44 hotels that have restaurants. With a room at one of these spots, all it takes to get a good meal is hopping in the elevator. Check out some of the most popular hotels in Sacramento that have restaurants below. Book Delta King HotelDelta King Hotel is a 3.00 star hotel and has one or more restaurant options. Book Holiday Inn Sacramento Downtown-ArenaHoliday Inn Sacramento Downtown-Arena is a 3.00 star hotel and has one or more restaurant options. Book Hyatt Place Sacramento RosevilleHyatt Place Sacramento Roseville is a 3.00 star hotel and has one or more restaurant options. Book Hyatt Place Sacramento/Rancho CordovaHyatt Place Sacramento/Rancho Cordova is a 3.00 star hotel and has one or more restaurant options. What are the cheapest hotels in Sacramento with pools? What's better after a long day exploring Sacramento then a relaxing dip in a pool? Finding the Sacramento hotel you need for a bargain! Cool off and unwind at one of our 147 Sacramento hotels with a pool. Browse some of the top deals on these hotels and resorts with pools in Sacramento below, but be warned: You may not want to check out! Motel 6 Sacramento Downtown has a pool and a 2.00 star rating. Red Lion Inn & Suites Sacramento Midtown has a pool and a 2.50 star rating. Ramada by Wyndham Sacramento has a pool and a 2.50 star rating. Extended Stay America Sacramento - White Rock Road has a pool and a 2.50 star rating. What hotels in Sacramento offer parking for guests? Once you've made your way to Sacramento, the last thing you want to deal with is finding parking close to your hotel. Avoid the hassle of parking around the block and carrying your luggage all the way to the lobby by booking one of our hotels with parking. Check out deals on some of the 166 hotels in Sacramento that offer parking for guests. Extended Stay America Sacramento - Roseville This hotel has a 2.50-star rating. Red Roof Inn & Suites Rancho Cordova - Sacramento This hotel has a 2.00-star rating. Motel 6 Dixon This hotel has a 2.00-star rating. Hyatt Place Sacramento/Rancho Cordova This hotel has a 3.00-star rating. Do Sacramento hotels offer 24-hour concierge services? When you're on vacation, things don't always go according to plan. Travel with peace of mind when you book one of our 17 hotels in Sacramento with 24-hour concierge service. That way you know help is always phone call or elevator ride away. 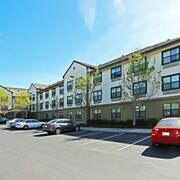 Try Larkspur Landing Roseville - An All-Suite Hotel. It's a 3.00 star rated hotel in Sacramento that offers concierge services 24 hours a day. Try Hyatt Place Sacramento/Rancho Cordova. It's a 3.00 star rated hotel in Sacramento that offers concierge services 24 hours a day. Try Best Western Plus Rancho Cordova Inn. It's a 2.50 star rated hotel in Sacramento that offers concierge services 24 hours a day. Try Larkspur Landing Folsom - An All-Suite Hotel. It's a 3.00 star rated hotel in Sacramento that offers concierge services 24 hours a day. What about low rates on non-smoking hotels in Sacramento? Country Inn & Suites by Radisson- Dixon- CA - UC Davis Area This hotel has a 3.00-star rating. Motel 6 Sacramento South This hotel has a 2.00-star rating. Larkspur Landing Sacramento - An All-Suite Hotel This hotel has a 3.00-star rating. Extended Stay America Sacramento - Arden Way This hotel has a 2.50-star rating. What are the cheapest Sacramento 3-star hotel deals? Our 3-star hotels bring you quality accommodations at a lower price point for the perfect, budget-friendly vacation in Sacramento. With 59 3-star hotels throughout Sacramento to choose from, you still have options. Browse our selection below. Larkspur Landing Folsom - An All-Suite Hotel. Situated in the suburbs, this hotel is 0.5 mi (0.8 km) from Folsom Premium Outlets and within 3 mi (5 km) of Sacramento State Aquatic Center and Nimbus Dam. Historic Sutter Street and Folsom History Museum are also within 3 mi (5 km). Hyatt Place Sacramento/Rancho Cordova. This family-friendly Rancho Cordova hotel is within 3 mi (5 km) of Sacramento Children's Museum, Mather Sports Center, and Mather Golf Course. Race Place Motorsports and Sacramento State Aquatic Center are also within 6 mi (10 km). Larkspur Landing Sacramento - An All-Suite Hotel. Located in Downtown Sacramento, this hotel is within 3 mi (5 km) of California State University Sacramento, Arden Fair Mall, and Cal Expo. Mercy General Hospital and Granite Regional Park are also within 3 mi (5 km). Delta King Hotel. Located in Downtown Sacramento, this hotel is steps from Sacramento History Museum and California State Railroad Museum. Crocker Art Museum and California State Capitol are also within 1 mi (2 km). What are the best deals on 4-Star Hotels in Sacramento? Sacramento is full of hotels and it can be hard to narrow down where you really want to stay. Luckily, we've done that hard work for you be narrowing you from 197 hotels throughout Sacramento, to the 7 4-star hotels in Sacramento. Our 4-star hotels in Sacramento are exactly what you need for your next family trip, romantic weekend, or solo getaway. Check out our most popular deals below. 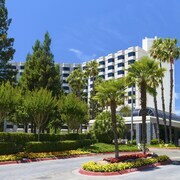 Hyatt Regency Sacramento: This downtown Sacramento hotel is across the street from the State Capitol and Capitol Park, and one block from the convention center; Sacramento Int'l Airport is 12 miles away. The Citizen Hotel- Autograph Collection: Located in Downtown Sacramento, this hotel is within a 10-minute walk of Cesar Chavez Park and California State Capitol. Historic Governor's Mansion and California State Railroad Museum are also within 15 minutes. What are the best activities to do in Sacramento? Urban Adventure Quest - Sacramento: Starting at just $8 per person. Midtown Arts Food & Walking Tour: Starting at just $78 per person. Premium Up Valley & Castle Trolley Tour: Starting at just $139 per person. Private Wine Country Tour: Starting at just $125 per person. Great location to everything in downtown Sacramento and walking distance to Golden One event center. Really enjoyed our stay! One of the best hotel that I have spent the night over. Having previosly done a Mississippi River, I enjoyed the historical aspects of the Delta King. Staff was very friendly and accommodating. Room was very clean and spacious. Beds were just okay. Location is fantastic, right next door to the UC Davis Conference center where we attended an event. The suite was spacious and comfortable, the bed was quite nice as well. I was impressed with he shower, most have no pressure, but this location's was quite good. All in all a great stay. © 2019, Trip Network, Inc. (d/b/a CheapTickets) All rights reserved. CheapTickets, CheapTickets.com, and the CheapTickets logo are either registered trademarks or trademarks of Trip Network, Inc. in the U.S. and/or other countries. Other logos or product and company names mentioned herein may be the property of their respective owners.